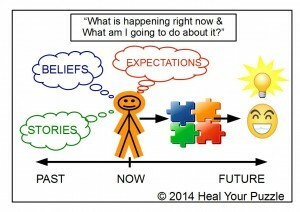 Heal Your Puzzle » Blog Archive » ALL SYSTEMS GO! Have you ever wondered what it would be like if all your dreams came true overnight and you woke up into a day that felt wonderful and flowed magically? I am feeling a little bit like this at the moment which is great… but I must admit that I am waiting for my feet to land back on the ground with a big thud! What I have noticed is that patterns in my life have changed over the last couple of months… not all of them but there is definitely a change. My Year started off by looking much like those of the previous decade… starting with lots of promise, a project or two begun, but by the Spring, for one reason or another, the energy and momentum in this had faded; most frustrating but strangely as expected. I wrote back in March this year about how we make decisions, about having all the pieces of the puzzle, and how sometimes decisions just make themselves and I pictured this with a shining light bulb (reprinted here).